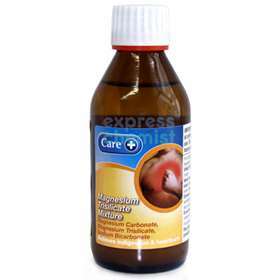 Magnesium Trisilicate Mixture - Relieves indigestion and heartburn. For symptomatic relief of indigestion, heartburn and dyspepsia. Directions for Use: Shake bottle before use. Take mixture by mouth. Adults, the elderly and children over 12 years - Take 2 to 4 5ml spoonfuls in a little water. Take three times a day or as required. Children 5-12 years - Take 1 to 2 5ml spoonfuls in a little water. Take three times a day or as required. Ingredients: MAGNESIUM TRISILICATE, MAGNESIUM CARBONATE, SODIUM BICARBONATE, SODIUM PARAHYDROXYBENZOATE, SODIUM.